Regarding this, you shouldn't have to have the song for the song info to show up. Meaning you shouldn't be getting a "Cannot be restored" error here. You could try isolating the problem files to see what's going on. Could you show me how you have those files set up? For customs, I've been using sZGE with great success. No problems, hundreds of custom songs installed and working. I'm unsure if it matters, but the data above says these two songs are from the sZBE generation. Also, it mentions the path names for the midi file as (midi_file dlc/content/songs/dunebuggy/dunebuggy.mid) and (midi_file dlc/content/songs/ladybug/ladybug.mid). Nothing about _plus like the next step. Is that supposed to be that way? After this, I used RB3WiiCustomsManager to compile the bin files and dropped the two files, 001.bin and 003.bin into the \private\wii\data\sZAE folder of the SD card. Cleared the cache, loaded my library in, tried to play one of these two songs... still no harmonies. The rest of my library of customs works fine. luckily. Help is appreciated, and, as always, thank you very much for your patience and expertise. It can be fickle sometimes. No, the midi_file line in the DTA doesn't matter here since RB3 does not seem to read it. Everything else looks correct though. In times like these, it helps to pull everything back and just work on the problem files. So try just loading your compiled spoof file. If it works, anything you've set to upgrade should show up in-game (though won't load since you won't have the song files in this test). If the file isn't getting read, then we can see why it isn't. As you mentioned on discord, did you ever get around to at least making it possible to use files for the sZAP generation; the PAL version of the sZAE generation? What would ultimately be nice is if we could provide replacement app files for all the DLC to add in both harmonies (where possible), and also album art (for songs that lack it), and integrate the album art showing immediately after finishing a song feature that the RBHP setup seems able to invoke (that RB3 doesn't do normally). That would add serious polish to RB3 Wii. I thought I should mention I finally got the RBHP working for the Wii (a few months ago, actually) and I feel like a professional now. The missing link that caused me such a headache was you must actually own the DLC you're using to spoof the system. If you try to input your own file without actually having the non-existent original, it won't register and there will be no effect. As soon as I purchased The Kill by 30 Seconds to Mars and tried again, bam, it worked. Kudos to all involved. Having harmonies in hundreds more songs in my library is a joy and much appreciated. The data files link on the spreadsheet is dead. Wii users have enjoyed support for RBHP for over a year now. The process is still much the same as the general guide(which is due for an update soon). This guide will try to go over it with a few changes that should make the process a bit simpler. You can always find the latest archive on the RBHP spreadsheet. I maintain this, so please let me know if there is a problem with some of the upgrades. Here is what it should typically look like. You should also create a folder named sZAE, to keep all this together. Unpack the new RBHP packing tools in there. This has to be separate from the sZFE generation used for packing customs. Don't mix them up! Here is what your RBHP packing environment should start to look like. "Kryptonite" will come with this. As it is, it's ready to build! Let's say you want to upgrade the song "Smooth Criminal". You'll find this in the DLC 2009 folder. 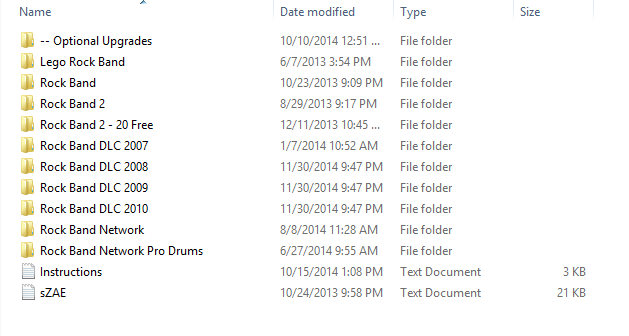 You should see 3 files: a MIDI, a songs.dta, and an upgrades.dta file. 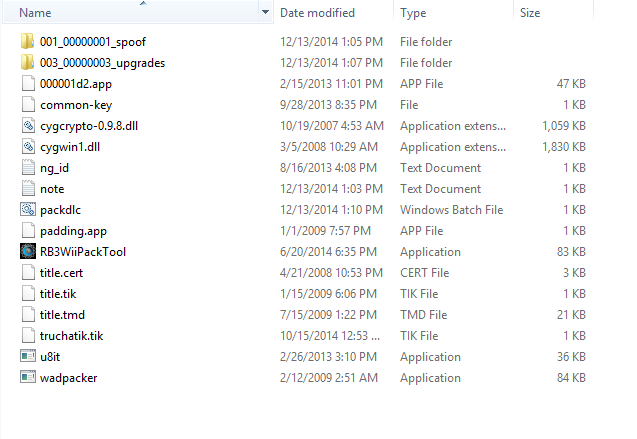 To add this on to the provided upgrade, first open the "spoof" folder. Find the songs.dta file. This file is necessary because the game reads it first and will ignore the same song's dta file if it's found later, ensuring an upgrade. With both folders open, first open the songs.dta of the song you want to upgrade. Copy it all. Then open the one from the spoof folder. Go to the end (Ctrl+Shift+End), and paste it there. You don't have to worry about updating the path data. You can fit as many dta files as you want, as long as it's all under about 500 KB. That's a couple dozen songs. Now, go to the "upgrades" folder. Simply drag and copy over the midi in the same place you see the provided midi. Then, just like with the songs.dta file, open the upgrades.dta file of the song you want to upgrade, copy it all, then open the provided upgrades.dta file and paste it at the end. This time though, make sure the path is actually correct or the game will have no way of finding it or may show the wrong one in-game. It's 003. You can fit many more upgrades inside this one folder. It all has to be under about 500 KB though. It's roughly 10-15 upgrade midis. If you are only building APP files, then you don't have to worry about anything that involves wadpacker. For building BIN files, which is more common, make sure that the common-key file is not 0 and that the ng_id file is not 0. This should be done already if you've packed customs in the other guide. Run RB3WiiPackTool and then run the packdlc.bat file it created. You should have the BIN files you need! Put these on your SD card in the sZAE folder. If you are upgrading a song you have not downloaded before, downloading it after the game has read will allow you to play the upgrade right away! Because your cache is saved after new songs are loaded, it won't let you replace any previously loaded songs with the new songs.dta built this way. Resetting the cache is easy with WiiXplorer. You can follow my short instructions on getting it set up and how to erase and or backup your cache this way. With that done, boot the game and get to the main menu. All your content should load, but if it worked correctly, you should now be able to play your RBHP upgrades! If you looked at this, look at it again. All songs under the "sZAE" generation are special cases. Trying to load the RBHP songs.dta through the spoof file won't work in this content generation because oddly, the game prefers the real one every time. To meet this requirement, RBHP-upgraded sZAE songs come with a .app file pre-built with the upgrade (and even album art) baked in. All these files are completely self-contained to work with the actual song data you should have on your SD card already. More of these are coming soon to complete sZAE. In this example, BIN# is 123. Then it should pack just the one file. Remember to copy this along with the automatically generated BINs. 30 Seconds to Mars's "The Kill" is also a special case. This guide is overwriting its songs.dta file. If you have the song, it's recommended you add the RBHP-provided songs.dta file into the spoof file. You won't get album art or preview audio this way, but the song should be upgradable if you still include its upgrade midi properly. All American Rejects' "Move Along" will also be overwritten in this sample setup. But like the example above, you can add its songs.dta file to the spoof and the song should play fine. Even I keep running into some errors a lot. Here are some of them. Songs don't show playable Harmonies. This tends to happen when there is an issue in your spoof file. If there is a missing parentheses anywhere, it could break all the songs after it. Find out which songs aren't upgrading and correct the issue. You'll need to reset the cache. Songs don't show playable Keys. This could be similar to the problem above, but it could also be if I forgot to set the difficulty in the DTA. There's an issue with copying this part over right now, so this should quickly become a non-issue. Harmony part show wrong lyrics in-game. This is likely the result of not modifying the upgrades.dta path correctly. It must read like the one provided: dlc/sZAE/###/content/... With # being the BIN number of the folder it's in. Game freezes on loading screen. When this happens, it could be because the upgrade midi is no longer available. This can happen if the upgrades folder that its contained in gets erased somehow. For example, don't mix spoof files with upgrades because the game automatically erases the spoof file and everything in it. This can also happen if the songs.dta file is improperly configured for the audio it's trying to read - more commonly because a keys upgrade doesn't have audio associated with the part. Game freezes on menu screen. After the loading bar appears, the game will freeze at the file it was trying to load. This can happen when the DTA has a mistake such as a missing parenthesis. Go back and find the mistake. I think Notepad++ helps in finding the error. Getting "Content cannot be restored" error. This is a broader error, but is referring to a problem with your system files. Based on the input from many users, this could happen because you don't have your system IOSes updated. Follow the guide at WiiHacks more closely and make sure all the WAD files in Chapter 2 are installed and show up on your SysCheck. This is my SysCheckand it should match that for the most part (IOS223[38+37], IOS249 d2x, etc). This is necessary for allowing fakesigned content to load. Content does not appear after loading. If even after loading and everything seems fine, content still isn't showing up, it could just be some odd glitch Try resetting the cache and taking out some songs from the songs.dta file if you had done that. Check over it again in case of some other error. If you are still trying to load "Dani California" or "Black Hole Sun" without the dta file provided from the RBHP Wii pack, then this would also happen. Anything else, please ask it here. I know it's a bit more involved and we're in need of more time-saving software, but once you get the hang of it, it's not too bad. I could record another video of the process if that helps. the link to download the pack it's unavaiable. can you fix this? I've updated all the links in the main guide now.